Blue-Green Algae: Should You Be Worried? Home » Blue-Green Algae: Should You Be Worried? Blue-green algae is a common roofing problem that doesn’t affect the roof’s performance, but it certainly can make any roof look ugly. If you have these dark streaks on your roofing, read on as Signature Exteriors takes a look at how you can treat and prevent it. Blue-green algae is a species of tiny bacteria called Gloeocapsa magma, and is spread by the wind, very much like spores or pollen. It grows quickly in moist environments and can protect itself from exposure to the sun. In fact, while it’s called “blue-green” algae, the stains are often almost black. The dark color is like its outer skin, which protects it from UV rays. 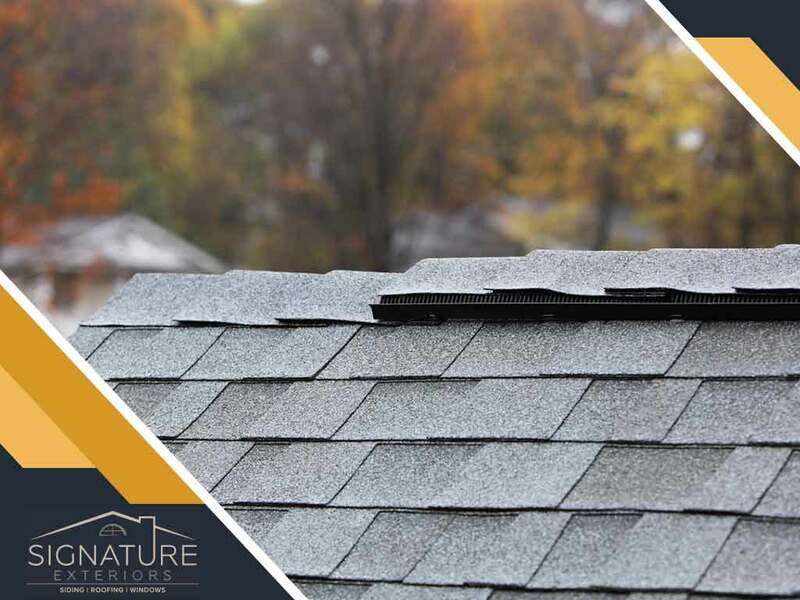 According to the Asphalt Roofing Manufacturers Association (ARMA), blue-green algae has no damaging effect on asphalt shingles or any other roofing material. However, the dark streaks are easily seen from the curb, especially if you have light-colored roofing. It can be difficult to remove the longer it stays on the roof, especially on porous materials such as tile or wood shakes. If you already have such streaks on the roof, you can clean it with chlorine bleach diluted with water at 1:1 ratio. Pour the solution over the affected areas, then rinse off with water from a garden hose after 15 to 20 minutes. Make sure you take all precautions when climbing the roof and make sure you are wearing appropriate safety gear such as gloves and eye protection. Also, cover surrounding landscaping and ensure your children and pets are indoors when you’re using the bleach solution on the roof. There are also products that can prevent blue-green algae infestation, such as zinc strips. GAF manufactures Master Flow® zinc strips. If your roof is up for replacement, we recommend choosing shingles with built-in protection against algae stains. This includes products such as GAF StainGuard® Shingles. The copper content in the granules are hostile to moss and algae and are especially effective in killing blue-green algae before it can spread. To learn more about our roofing options, call Signature Exteriors today at (866) 244-8029. You can also fill out our contact form to schedule a free quote. We serve Westchester and White Plains, NY, as well as nearby areas in Connecticut.